Years ago this used to be a fun game that I enjoyed playing. Now, I would have more fun and less frustration slamming my head against the wall. The game was perfect back when it was simple. There were no annoying features, no stupid add-ons, and no dumb challenges or pop-ups. Even the ads weren't as bad as they are now! Once the developers started adding their "features", the game started to go downhill, bigtime. I used to like going to the search function and searching for 3 people, then going back to the games I was currently playing while it looked for the three new players, and it would add the games in the background. Then this got changed to an annoying pop-up every time the app found a new player. Now, the game jumps straight into a new game immediately, before I can tell it to search for the other two players! NOW, the app jumps straight into a new game right when you open it! THERE IS NO SETTING TO TURN THIS OFF. I also liked being able to see my games right at the top of the screen. Now this space has become crammed full of Facebook links, Word of the Day, Challenges, and other junk I do not care about nor want to see. 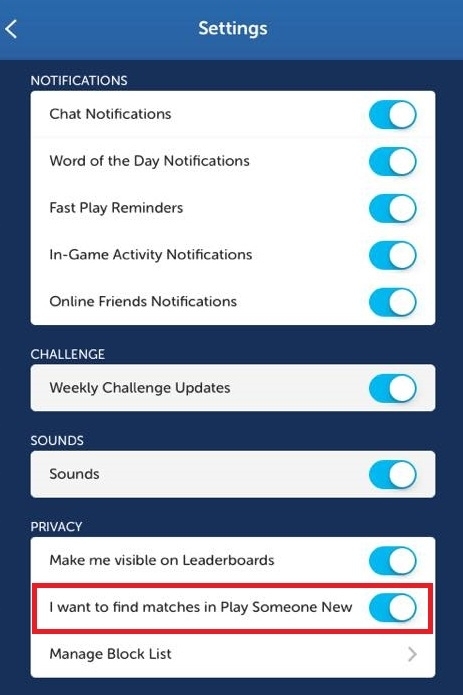 THERE ARE NO SETTINGS TO TURN THESE OFF. 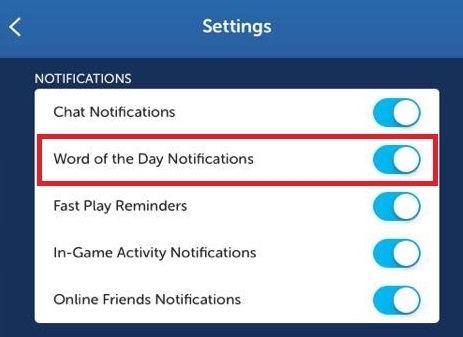 The setting for the Word of the Day DOES NOT WORK OR TURN IT OFF. The splash screens when games start and end are completely unnecessary and a waste of time, especially when viewing already finished games at the bottom of the screen. I DO NOT want any more pop-ups than this game already has! It is stupid to have to click several times to actually get to the game itself. The game also shows "Results" at the top for finished games. This needs to go away. It is unnecessary and takes away from the game playing. I already know who won the game and if I need to look, the game is shown right at the bottom. I have to click on several things just to be able to clear these from the top of my screen! THERE IS NO SETTING TO TURN THIS OFF. The ads now are absolutely ridiculous. I understand the need for ads, but originally, they used to be simple picture ads. Now, every single one is a video, and this QUICKLY uses up my data when I am not on WIFI! Now, even the few picture ads make you click several times to exit them. Also, half the time the ads will not load correctly, or fail to close when they are through playing. This causes me to have to exit and restart the game or in many instances, delete and reinstall the game COMPLETELY in order for it to work again! I usually like to pay for apps that I enjoy to get rid of the ads, but I refuse to spend any money on such a poorly coded and maintained app, especially when updates only include seasonal skins, or more unnecessary junk and pop-ups, and NO FIXES for many of the bugs that this game has had for years!! When Community Match was introduced, this was this games saving grace. I liked this feature well enough that I stuck with the game for a while longer, as now I could play people locally and in the same time zone, and not have to wait for plays! Then, suddenly, the one good feature that this app had was removed. Zynga support refuses to inform their customers of why such a well liked feature was taken away, and their only response when this question is asked is "Check out our few Play Someone New feature!" This shows blatant disregard and is insulting to anyone who plays this game, especially the people that have paid good money for it. This "Play Someone New" feature is also as poorly executed as the rest of the game, because for me it only brings up people I've already play with the majority of the time. At least someone there was smart enough to allow you to turn this off in the Settings. Now, the most recent issue I've had with this game is the Chat function. Yet again, an ad froze up on me, requiring me to delete the game and reinstall it in order for it to work again. Now, all my chat messages have been deleted, and I cannot send, receive, or view any new ones. I also have the chat notifications popped up on random players indicating that they have sent me a new message, but when I go to view it, the chat screen is blank. When I refresh my list, all of the chat notifications come back!! No matter how many times I reset or delete and reinstall this app now, I cannot get my chat to work correctly again. Overall, I am frustrated and disappointed in where this game has gone. Nobody at Zynga actually seems to care about their player's opinions or actually fixing any of the bugs in the game. I'm sure this will be backed up by the fact that most of Zynga team's responses to these issues is a meaningless reply of "We will forward this to our developers!" in the majority of the posts on this forum, as I'm sure will be the same in their reply to my post. 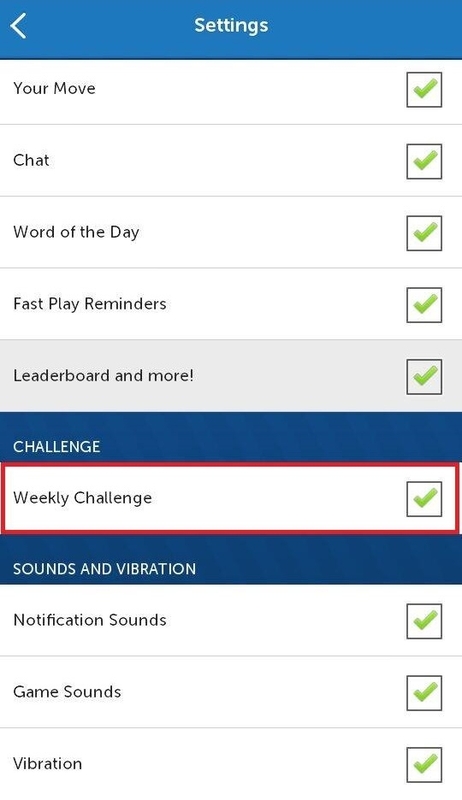 If these above issues are not fixed ASAP, I have no reason to play on Words With Friends anymore. I'm sure there are plenty of other Scrabble apps out there that work much better than this one. Are you referring to Play Someone New? If so, you can disable this by accessing Settings. I've attached a screenshot to walk you through. Appreciate the report on this one. I suggest to perform basic troubleshooting steps for iOS or Android to stabilize your connection. As soon as you're done, please try turning these off again. We have yet to receive news regarding Community Match, so please stay tuned for updates. Please make sure that you and your opponents have the same game version; otherwise, both of you may experience errors when sending/receiving Chat messages. To download the recent update, please click here. Sorry for the inconvenience these issues have caused. Experienced developer here with oodles of coding experience and a few U.S. patents. The "settings" don't work right. For example, I have no interest in playing the wordmasters. I deselected that checkbox. And yet, the challenges still appear. This after running the standard gauntlets (force stop, clear cache, uninstall/reinstall). I haven't tried deselecting everything on a PC in Facebook, but if that needs to be done then you shouldn't make it appear that deselecting them on a mobile device solves the problem.